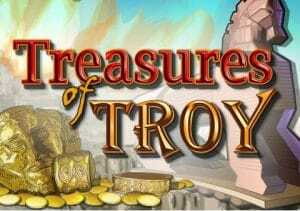 Journey back to the age of antiquity in Treasures of Troy, an ancient Greek themed video slot powered by IGT. Played with the Multiway Xtra game engine that offers 1,024 ways to win. Alternatively, you can opt for a familiar payline structure. The game also comes with a bonus feature that awards up to 130 free spins. Stakes range from 40p right up to £1,600 per spin. Set against the backdrop of the ancient city of Troy and encased within a classical temple style building, the reels include A to J playing cards alongside swords, helmet, and 2 warriors. The most lucrative symbol is Helen of Troy. The precise payouts depend on whether you opt to play with the 1,024 ways to win active, 40 paylines active or both. Pay the extra and opt for both and Multiway awards formed by hitting the same symbol on successive reels come in addition to the standard payline payouts. Joining the standard symbols is the Treasures of Troy logo which is the game’s wild – appearing on all reels apart from reel 1, it replaces everything apart from the scatter. The famous wooden horse from the siege of Troy is that scatter – landing 2, 3 or 4 of these on the middle reel triggers the Free Spins Bonus feature and with it 10, 15 or 20 free spins. You can re-trigger more free spins if the Trojan Horse makes a welcome re-appearance on reel 3 during the feature. A maximum of 130 free spins are possible! As far as volatility goes, we’d put Treasures of Troy in the medium range – if you opt for the full complement of Multiway Xtra and payline game engine, there’ll be plenty of action on offer. Like many video slots from IGT, this is a pretty simple game (once you’ve got past the 1,024 ways to win, payline conundrum). The imagery is done cartoon style and the soundtrack is a little Spartan (excuse the pun). It’s a similar story as far as features go with the only one on offer being the free spins feature – it’s decent enough but doesn’t offer much to make the game stand out. If your idea of a good night is documentary on BBC4 about the ancient world, then Treasures of Troy should appeal. If not, you’ll likely find more entertaining old world adventure on offer elsewhere – like the Age of the Gods series by Playtech.